Three years ago I read the story of a Tibetan tribal, handpicked by a powerful king to save India. The man chosen for the task was unsure of his own power, ignorant of his destiny. As the ignorant yet benevolent Shiva scuffed at strong headed Suryavanshis, fell in love with their Princess and swore randomly while smoking marijuana, I felt a strange mix of admiration and aversion towards Amish for molding my legendary God Shiva into a common man. But, by the time Immortals of Meluha ended, I was awestruck by the vivid contrasts in Shiva’s character. His passion made him ruthless, his love made him break the laws and yet his innocent heart was ready to hug all. A formidable hero was born in Book 1 of Shiva Trilogy by Amish Tripathi. And, as I finished Book 2 Secret of Nagas today, I am bowled over by the duality of nature. The good vs evil may be an old debate but Amish has given it an altogether different meaning. Though I had always been an ardent devotee of Shivshankar, drawn to his human like aura. but, I struggled to accept him as a common man in Immortals of Meluha. I was irritated with his depiction as an uncouth swearing immigrant. Like a small kid, I was not ready to accept any imperfection in my God. And, perhaps that’s why I avoided Secret of Nagas for so long. But, now I know that I could not be more wrong. All my apprehensions were a figment of my own imagination. Shiva is too strong a character to be fiddled with. 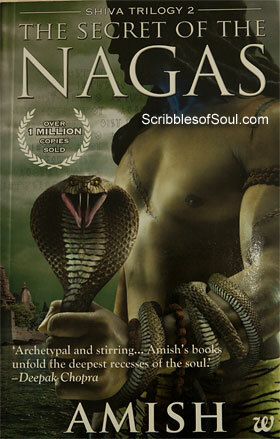 And, despite a few fumbles in Book 1, Amish has successfully reinterpreted our mythology in his unparalleled fictional way in Secret of Nagas. He has modified the legends and myths a bit, giving them a modern twist. And, yet the book can be enjoyed as a fictional work with shades of a fast paced thriller, without hurting the religious sentimentality. In Secret of Nagas, a new confident Shiva is introduced, who has settled into the role of Mahadev, worthy of every iota of devotion he commands. He has been literally transformed into a God, accepting the role of Neelkanth, if only for the greater good of humanity. Shiva had already reconciled the Suryavanshis and Chandravanshis in Book 1 and Daksha was proclaimed as the Emperor of India. But, now Shiva is facing an even greater enemy. The Naga who killed Brahspati in Immortals is now back in action, furtively stalking Sati. In a spell bounding chase sequence, Shiva comes in direct contact with the vile Naga and it becomes apparent that Brangas are close associates of Nagas of Panchvati and if Shiva wants to know their secret, he has to deal with Brangas. As Shiva wandered from Ayodhya to Brangradiri to Panchvati, Amish spun a riveting story, where myths blended into traditions, divulging much more than just the origin of Nagas. Till now, I have only talked about Shiva, but Amish was thoughtful enough to give equal emphasis to Sati as well. She was depicted as a proud and able princess in Immortals, but in the present book, she is as much a warrior as Shiva. The episode where she tackles Man eaters of Icchawar was an outstanding example of her administrative and martial skills. Other than Sati, I was quite drawn to Anandamayi, the quintessential sensual, headstrong, brave woman, a worthy consort for Meluhan General Parvetshwar and even Queen of Nagas came across as an independent woman with her own set of rules and principles. But, strong characters can hardly survive without a good plot and engaging narrative and in Secret of Nagas, both are in plenty. Amish’s writing style has matured a lot. The prose is simple yet addictive and his imagination spellbinding. As I said before, Amish has modified the legends a bit. And, a classic example is the story of Parshurama beheading his mother. Here, the story was turned on its head in a convincing manner, with shades of patriarchal honor killing. Frankly speaking, Amish is a great word twister and has the ability to enamor with his brilliantly coined terms. He continued to address his main character as Lord of the People, the most common Hindi name for a legendary God and still I could identify him only when the author decided to lift the veil by giving his physical description (Sorry for this spoiler readers, but I just could not stop myself from divulging this masterstroke). Similarly, I loved the way the author described telepathy. When he explained transmission of thoughts by Vasudev priests in terms of radio waves with the help of temple spires, I was fascinated. He did the same with daivi astras, making them yet another word for weapons of mass destruction. The more I read, the easier it became to accept the tall legends as scientific inventions instead of fantastic mumbo jumbo they appeared to me earlier. Once he explained the meaning of Branga as the country in the cradle of Brahmaputra and Ganga, the fantasy land was also instantly converted into the very real Sunderbans. I can go on and on about the wonderful story and yet would not be able to do justice to this unique tale. I recommend Shiva Trilogy strongly, but do avoid the mistake I made. Reading the books in quick succession would be better. To sum up, Secret of Nagas has rekindled in me a burning desire to know our legends and then to turn them inside out so that I can savor the kernel of wisdom embedded between the thick layers of nonsensical superstitions and unwarranted atheism!